Krauthammer: Newt's Attack On Romney Is "What You'd Expect From A Socialist"
"On the bet, look, if he said $1 million, it would have been understood as not an actual offer but something that is outrageous. Meaning this is a slam dunk. But being Romney he thought well, maybe a million is too high and $10 will not be understood. So he chose the middle path, which of course is the wrong thing to do," Charles Krauthammer said about Gingrich betting Romney that he would not return money he made from "bankrupting companies" when he was with Bain Capital. "But I though what was remarkable is what Newt did today. It wasn't just that he went negative. He pulled out the heavy artillery on this on his attack on Romney. I am with the commentary that Brit Hume did earlier in the show. What kind of attack is this of one so-called person of the right to another? What conception of capitalism do you have if you attacking your opponent for entering what is the risk taking of capitalism? It's the old line from Schumpeter which is that capitalism is creative destruction. 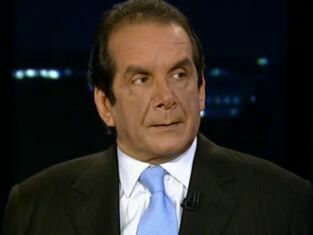 And this kind of attack is what you'd expect from a socialist," Krauthammer continued. "A person goes to capitalist system, he succeeds, he fails. You get a bankruptcy, you get people laid off, but is that a way to attack a fellow conservative? I think that is quite remarkable and telling. And it makes you wonder about the core ideology of Newt himself," he said. Krauthammer then suggests that instead of attacking Romney, Gingrich should defend what he did to earn $1.5-$1.8 million from Freddie Mac. Gingrich To Romney: "Only Reason You Didn't Become A Career Politician Is Because You Lost To Teddy Kennedy"
Wasserman Schultz: Obama Inherited Bad Economy "Thanks To GOP Policies Under Bush"
Obama On U.S. Drone Captured By Iran: "We've Asked For It Back"